For most of us, the Internet is a useful and enjoyable source of information and entertainment. But for a criminal few, it’s another new way to make money illegally. International crooks are now targeting ‘For Sale’ ads on smaller specialist websites as a way to pass stolen cheques and launder illegal money, and sad to say Agilitynet is no exception. Fortunately, though, the scams are fairly easy to spot if you know what to look for. Take a look at the list of warning signs which we’ve included on the ‘Fleamarket’ page for several months now. They apply not just to Agilitynet but to any online auction or For Sale section as well as email invitations. I recently advertised a dog guard and tailgate guard for sale via Agility Eye and Agilitynet, hoping that this would ensure that only genuine agility people would enquire. After about a month, I had an inquiry from someone via e-mail (wilson_sharon2000@yahoo.com), who said that she lived in Amsterdam. A few days later, I received an e-mail to say that her 'associate' was sending a cheque drawn on an English Bank. Then another e-mail was sent saying the cheque they had sent was for more than the goods, so when it arrived would I pay it into my bank account and when it had cleared could I transfer the excess back to them in Euros – details to follow. I was rather shocked when the cheque arrived for £2,000 but not overly suspicious. I decided to pay the cheque into my bank account (on a Friday) and wait for it to clear before releasing the funds and goods. Over the weekend, I decided that I had been rather naïve and that I should have sent the cheque back to her associate who lived in Athens. The envelope that the cheque arrived in had to correct postmark. I contacted my bank on Monday who advised me to contact them and ask them to stop the cheque. I sent an e-mail to ‘Sharon’ and requested that she had the cheque stopped and one for the correct amount be sent. Within 15 minutes of sending the e-mail, I had a phone call from her associate in Greece. The man who had a foreign accent told me that the funds had already been cleared and demanded that I transferred the funds immediately. This person was very intimidating, and it is possible that some people would have complied with his demands. I told him that the cheque he had issued was with the same bank I am with (HSBC) and they had told me differently. I also told him that I had spoken to the police who considered that it could be a case of fraud. At that stage he said goodbye and hung up. I have heard nothing from either of them since and the cheque has now come back unpaid. I have spoken at length to my bank’s fraud department and one of the questions they asked was 'do they want the money transferred to Western Union?' Which they did. This is by all accounts a fraud that is wide spread, people are employed to search the net for smaller specialist web-sites and find any goods for sale. The cheques, which are sent, are usually stolen. The recipient is then put under pressure to release the excess funds either before the cheque has cleared or as soon as and the cheque is then stopped. Apparently a cheque can be stopped even after it has been cleared. I worked in a bank some years ago and was totally unaware of this. The goods have also been collected so not only have you lost out financially but the goods have gone also. I always thought that I was ‘street-wise’ having worked in a bank and am now employed in a law enforcing environment but it is easy to be caught out. By only advertising in ‘agility areas’ I was convinced that I would be dealing with only genuine people. Yes, I agree I was stupid to pay the cheque into my bank but thank goodness I did eventually start to question my actions and still have my money and dog guards. Anyway anyone want to by a dog guard? Lindsay Freeman started doing agility about seven years ago, just for something to do and got hooked. She started training with Up Andover, then trained with Lesley Olden and now trained with Gillingham and Lesley when work/time permits. 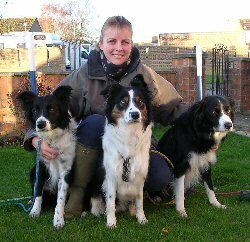 She has three WSD/Border Collies, of which she runs two. From left to right on the picture is Taz (Tazzle Bazzle)- 7 1/2 years, Cassie (Bekkis Aphrodite) - 2 1/2 years and Tyke (Tyke By Nature) - 8 1/2 years. Tyke won me out of starters at Supadogs this year after a few near misses. Cassie came out at the end of last year. However due to work and holiday commitments our season this year started at Supadogs. I love the sport and every clear round to me is an achievement especially with Tyke. She is married but has no kids (other than her husband.) She is currently in the Royal Military Police (Army) and has been for the last 11 years. I read your 'Buyer Beware' article this morning when checking to see if my advert for my stud dog had been added. A couple of hours later I had an e-mail from a Dr. Norman England wanting to buy the dog. 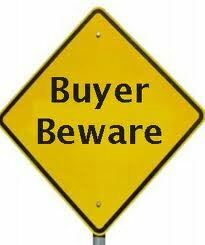 Following your recent article Buyers Beware, I thought I would just write to notify you that there still seems to be fraudsters abound. I have so far received three e-mails where it is obvious the senders have not read the ad thoroughly. The first one needed an urgent response as he was off on a Church crusade....yeah, right. To stress his interest the entire body of the e-mail was typed in upper case. The other two were from the same person, one e-mail was responding to an ad I did not place. Needless to say all three were sent to the trash folder. I haven't even bothered to reply with an 'item sold' e-mail.